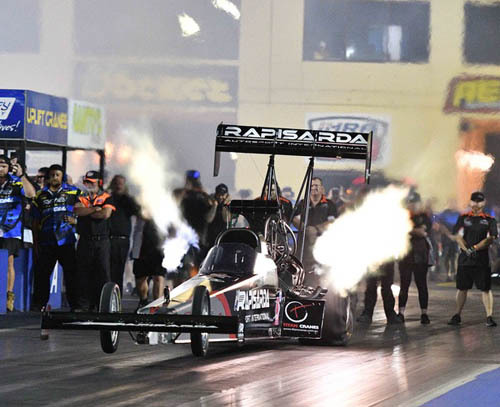 The Santo's Summer BLANK meeting produced a mixed bag of results for Rapisarda Autosport International squad of Wayne Newby, Damien Harris and Ashley Sanford. The two-day event was abandoned after the safety catch fence was destroyed following a high-speed crash in the final of Pro Slammer between Sydney duo Sam Fenech and Paul Mouhayet. Fenech's 'chutes failed to deploy properly after crossing the finish line and his Chevy Camaro careered through the sand trap, penetrated the safety catch fence tearing the support poles out of the ground then mounted the tyre retaining wall before coming to rest. By the time safety crews reached Fenech he was able to extricate himself from the car and walk away virtually unscathed. 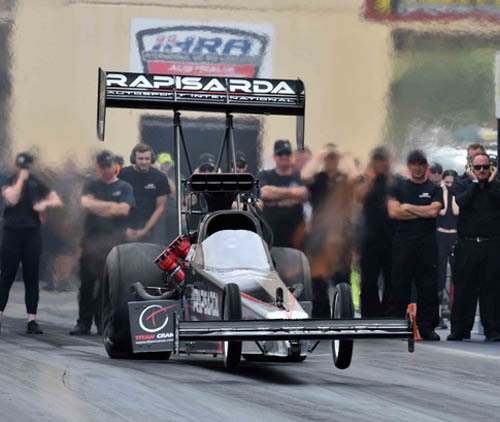 With no hope of repairing the damaged safety net race officials had no choice but to cancel the rest of the meeting including the final rounds of Top Fuel. The two-day meeting got off to an inglorious start with a track temperature nudging 65C and an air temperature of 42C meant there was little to be gained by taking part in what race organizers called 'shakedown runs'. Consequently Rapisarda Autosport International three cars remained under wraps. A cool change swept the venue overnight and delivered much-improved race day conditions. In round one Wayne Newby grabbed the win and bonus ET points for the round thanks to a 3.80/509 km/h in ousting Californian newcomer Cameron Ferre. Reigning 400 Thunder champ Kelly Bettes narrowly edged out Damien Harris and Sanford who was forced to slow after wearing out a clutch disk against three-time champ Phil Read. Second round and Harris and Newby struggled with tyre shake and went down to Read and Ferre respectively and in the all-women pairing Sanford lost to Bettes. Read and Bettes with two wins apiece were seeded to race for the overall winner of the meeting with the RAI trio racing for the minor places. With all cars waiting in the staging lanes the eagerly anticipated final round was cancelled in the aftermath of the Fenech crash. "That's racing," said team owner Santo Rapisarda with a shrug of the shoulders. "Today wasn't our day it's as simple as that. Read and Bettes deserved to be in the final. Everyone wants to win but there can only be one winner. But the way this meeting finished there was no winner. We were happy to run the quickest pass of the weekend, a 3.80 by Wayne in the second round. My boys will bounce back that's for sure."